Josh, I am presently sipping some Caol Ila 12. As I read your review, I get it, and I can pick out a lot of that stuff. You're better than I am at picking out these flavors! That said, I don't think the whole experience wows me in the way it does for you. I find Caol Ila to be too unrefined, tired, and somewhat flat in a way - meaning that I don't feel like the desirable flavors assert themselves the way they should. It just doesn't do much for me. Nice review, though! How much breathing time in the glass do you allow before beginning to sip, Ryan? If the bottle is new I would recommend at least 15-20 minutes of breathing time to open up before sipping. Caol Ila 12 is a fairly thin bodied malt so it really needs the air time to maximize the apparent sweetness and richen up the mouthfeel at mid-palate. Yeah, I think I did notice it getting a bit sweeter and richer later on. I generally just do one pour per evening which lasts me 2 hours or so, so I definitely get the whole gamut of breathing time experience, and this is my third night with it. I don't know if it's a big enough difference to change my mind about it, but you're right it does improve from right out of the bottle. Islays are polarizing in general and Caol Ila has a flavor profile that tends to provoke passions both pro and con. The iodine and rubber band flavors cause some people to intensely reject it sometimes - although it sounds like your issue is a lack of density of flavor - which wasn't really my experience. 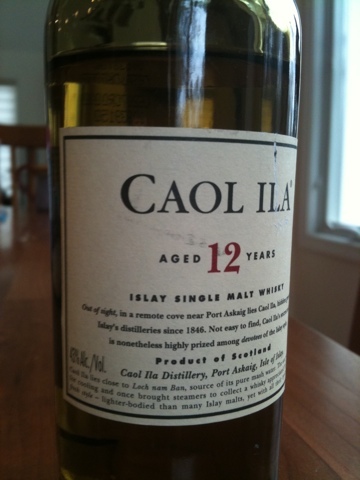 I found Caol Ila 12 to be gentle and floral; light but not too thin. Admittedly this is totally subjective. Thanks for discussing this. I wish I could share the 15 with you. For some reason my bottle of Caol Ila 12 is cask-strength and the label has the word Unpeated on it... okay this is a limited edition bottle and I'm debating whether to open it now or save it for a special occasion. From the reviews I've seen the flavor profile is closer to a Highlands malt than Islay. And the whisky is still smoky despite being unpeated. Palate: Rich, oily-smooth and sweet, with creamy fudge, and also alive with crushed black peppercorns: fresh and invigorating. Fewer fruity notes than younger versions. Water brings a softer, pleasing mouth-feel. Predominantly sweet, with crisper, salty notes and some dry acidity to keep things fresh, clean and by the sea. Finish: Crisp and clean, with a tongue-tingling after-taste (bitter-sweet plum tart) and a warming, medicinal after-sensation." Why? Even if the malt is unpeated, there may still be peat in the water, and salt air in the warehouses, and the influence of place (terroir) in a million little ways. I find it a fascinating topic to consider how a whisky comes to taste like the place its from. As to whether to drink it or save it? DRINK IT! Whisky is for drinking. Save it til when? When is a better or more important time? How do you know you'll even be alive then? As for investing - if you really want to do that, buy several, but always drink one now. ...just my 2 cents. Yes it's the 2010 bottle but I just bought it a week ago at Beltramo's in California. Sounds like they got one of the last cases because I can't find it anywhere else. There were about six bottles left on the shelf last week. You might as well check if they can deliver to your location.